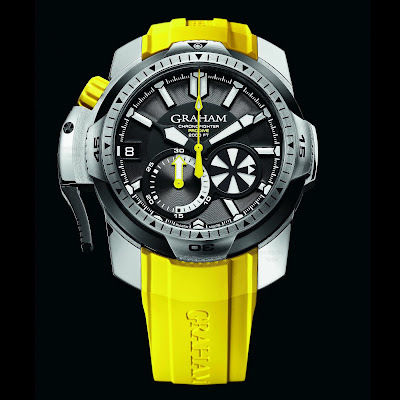 By TLex Graham of London have released the PRODIVE, which was previewed here in March. The finished watch looks pretty special. Quite sleek for a Graham really. 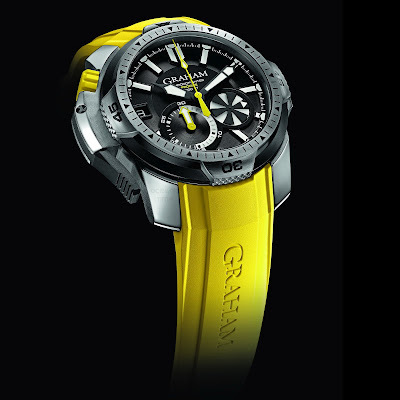 Their signature chrono trigger fits much closer to the watch case and is so a lot less hand-grenade like! It has been designed to be easily used with a divers glove, too. 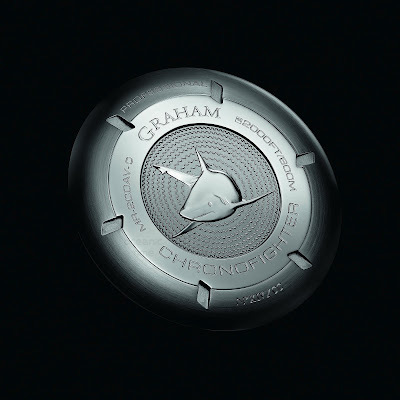 There's plenty of other evidence of Graham DNA; it's not too dissimilar to the Oversize Chronofighter DIVER either, yet it is a far more evolved dive watch both technically and aesthetically. 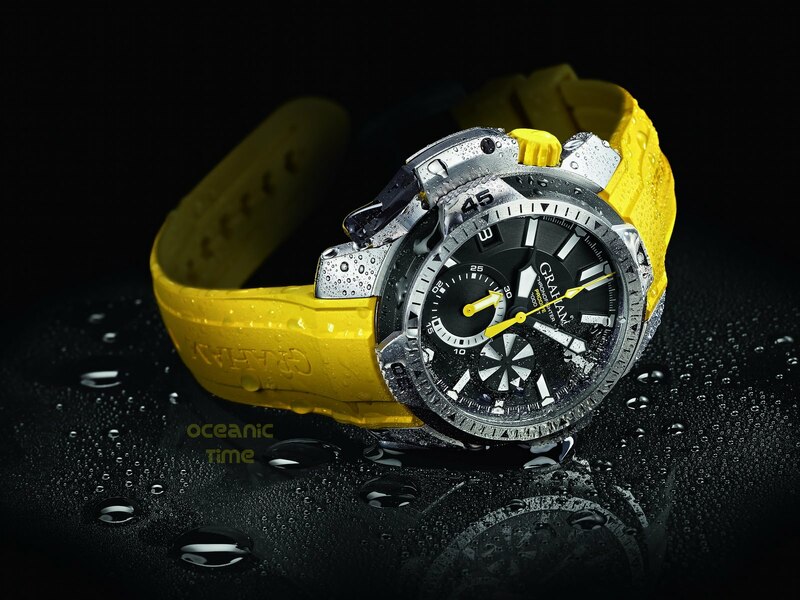 Diving features include: screwdown yellow rubber crown, screwdown 'shark' engraved caseback, sapphire crystal with AR, 600m of water-resistance and a Helium Escape Valve. 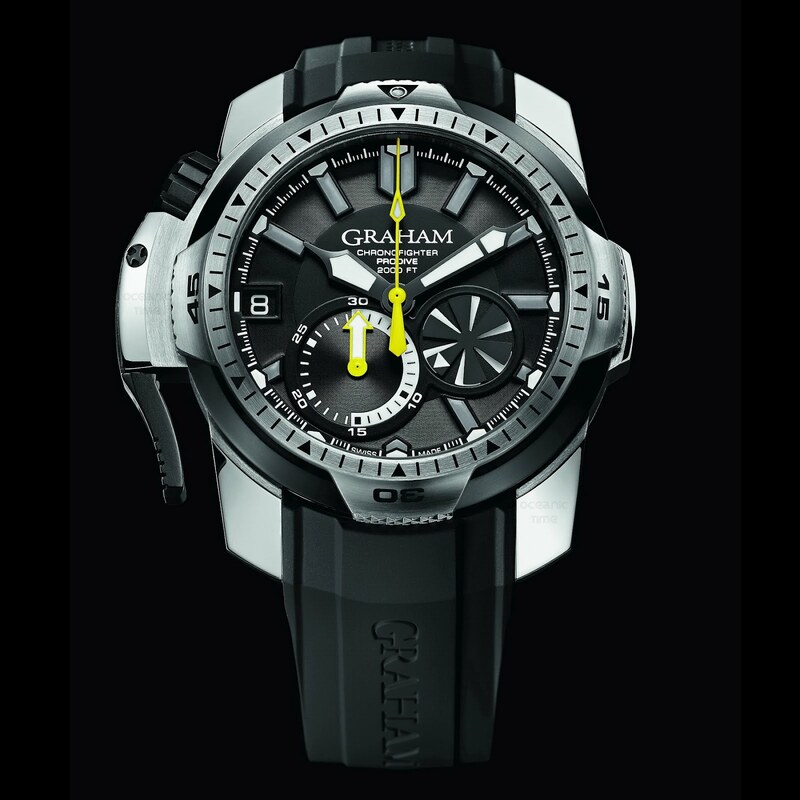 The watch is available with three dial / strap combos. Follow the link above to read my earlier report or read the full PR below. 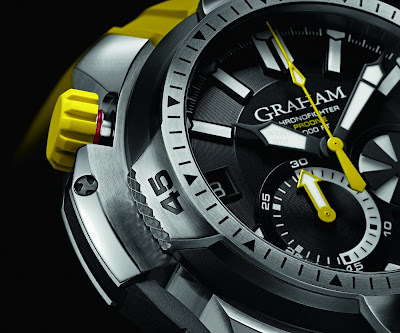 Graham also invite you to - switch the lights off and dive into the GRAHAM deep underwater world, where you can discover the watch on their new interactive homepage . 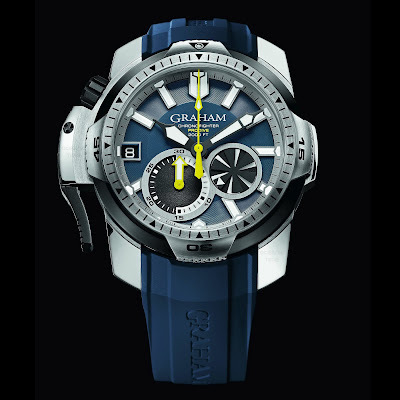 . .
From GRAHAM Darkness, strange creatures, high pressure, abyss, sea caverns, words that describe the unknown deep underwater world and sound mythical and full of thrill. GRAHAM wanted to make these words become reality and create a true luxury diver’s watch for professional adventurers and watch addicts. Clear, colourless, odourless, water covers 70% of Earth and is essential to all living creatures. GRAHAM is devoted to the creation of timepieces which respect nature and unknown territories and also give boldness to our users to experience the GRAHAM exciting world. Equipped with an isothermal diving neoprene rubber suit and gloves, the diving experience must be a sequence of easy and successful operations. Sea, lake, river, ocean, the GRAHAM Chronofighter Prodive is able to adapt to all types of diving and light changes. Deeper you go down weaker is the light and darker is the underwater world. A dark blue and black zone that spreads around you like ink in a glass of water. 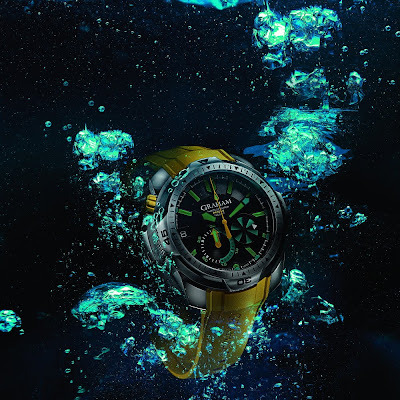 It will prevent you diving into troubled water thanks to a new generation of luminescent coatings, totally free of radiation. Two colours of luminescent indications are displayed and will be perfectly visible in great depths. The watch is perfectly readable from 25 cm in murky conditions. screwed yellow rubber crown with bayonet safety system and red ring, black PVD automatic Helium valve, domed sapphire crystal with anti-reflective coating on both faces, screwed steel case back with shark imprinted and limited edition serial number, integrated yellow rubber strap, steel folding buckle with diver extension. Limited edition: 200 pieces.